The piano can be intimidating to learn, especially when you’re starting later in life. There are certainly great adult beginner books out there but private piano lessons are definitely the best way to learn because your teacher can tailor the lessons to how you learn and for what skills you want to attain. If you’re interested in piano lessons, check out this page for finding local teachers in Houston here. Most people want to learn chords right away because they sound so good! It feels like you’re playing a real song, maybe even songs you know and love. There are a couple chords that are great starters. They’ll get your fingers comfortable and capable of quite a few songs right off the bat. Those would be C, F, G, and Am. These essential chords use all white keys so they are simpler to grasp before having to incorporate the black keys. Each chord is made up of three notes. The C chord is C, E, and G. With either or both hands, play those notes with your first, third, and fifth fingers (thumb, middle, and pinkie). Get comfortable with that first. Lift your hands and play them again. Move your hands away and find the keys over and over until that hand shape becomes comfortable. If you want a challenge, play arpeggios (play the C, E, and G notes separately from left to right and back to left). Once that is natural to you, try the other chords: F (F, A, C), G (G, B, D), and Am (A, C, E). If this is all brand new to you, don’t expect yourself to get it all down on the first day. Give yourself time for it to become a natural hand shape and a clear concept. Good luck with your new chords! With up to 88 keys, identifying the notes on a piano can be intimidating at first. Luckily there are some tools and tricks that can help you find them. If you look at the image below or at a piano, you’ll see plenty of white keys and groups of black keys. You’ll notice that the groups of black keys are in sets of two and three. These are the best visual way to find the notes you’re looking for. 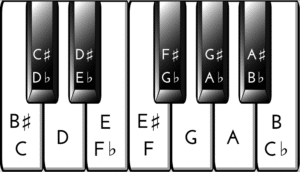 The first note you should memorize is C, which is to the left of the group of two black keys. If you are near a piano or keyboard, try finding all the Cs from the lowest (third white key on the piano) to the highest (the last key). Next identify F, which is to the left of the group of three black keys. From there you can pick and choose other white or black keys to identify along the instrument. The best way to get comfortable with the notes is to start from the bottom and find each of them along the piano to the top. This will give you the spatial awareness to find the keys you’re looking for with more ease as you practice. For information about piano sales or lessons, please call Maggie Pollio – Piano Consultant Houston at 832.594.7267. Improvisation is freestyle of music playing. What Can You Do to Lengthen the Life of Your Piano?